Alvin Bierley scores on a free kick. CHICAGO, Ill. – The Carleton College men’s soccer team saw its season come to an end with a heartbreaking 2-1 loss against No. 3-ranked University of Chicago. Alvin Bierley (So./Santa Cruz, Calif./Leland) put the Knights ahead with a gorgeous first-half free-kick, however, two late Maroon goals advanced Chicago to the Sweet Sixteen. “Remarkable season,” said Carleton head coach Bob Carlson. “This team has every right to be proud of everything they have done. They should hold their heads up high. They went two months without losing a game. These guys represented the Carleton community and the athletic department unbelievably well by excelling on and off the field. Throughout the match, Carleton (16-2-3) adapted their usual, ball-dominant approach and played a more conservative style against the top-seeded Maroons (16-2-1). The Knights were outshot 24-7 throughout the contest, the first time all year the opposition had more chances. From the opening whistle Carleton’s defense faced a stiff test, as Chicago, fresh off a first-round bye, came out of the gates fast. Within the first six minutes of the game the Maroons had two headers on goal, however Knight’s goalie Aaron Forman (So./Los Angeles, Calif./Windward) stuffed both efforts. Carleton had not managed to attempt a shot until the 27th minute when a foul from a Chicago defender gave the Knights a dangerous free-kick opportunity from directly in front of the goal and mere steps outside the box. Bierley stepped up to take the kick for Carleton, and curled a shot to the left corner, where it hit the crossbar, bounced off the diving goalie and rolled into the back of the net for a stunning goal. Univ. of Chicago goalkeeper Aaron Katsimpalis watches Alvin Bierley's free kick head sail beyond his reach. Despite taking the lead the Knights ended the half playing a more aggressive style of football as they searched for a second goal to provide an early finishing blow. The Maroons’ defense managed to hold up, however, with a long-range effort from Bierley being the closest Carleton came to extending their lead. With 45 minutes left in the game, Chicago threw everything they had at the Knights backline looking to extend their season. In the 50th minute a cross pinballed through the box before Forman was able to swallow up a shot and keep Carleton in front. Moments later the Maroons had another great opportunity to score, however, once again Forman stepped up with a diving save to keep the clean sheet intact. Finally, in the 79th minute Chicago was able to get on the board after an impressive curled shot from Adeosun Dayo—one of four All-Americans on the Chicago roster—nestled into the bottom right of the net. After losing the lead the Knights pushed forward looking once again to find their second goal and avoid overtime but were unable to find the final ball to create a great chance. 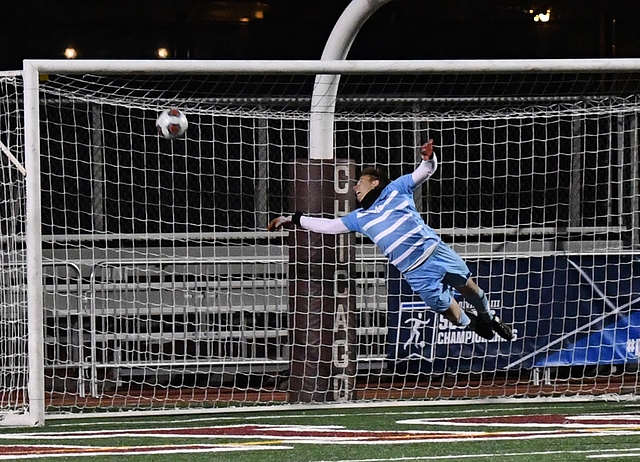 As the game entered the 89th minute one last Maroon attacking outburst proved fatal as Kyle Ruark managed to tap in a cross from Matthew Koh for the game-winning goal. Forman finished the game with nine saves, setting a new career-high, and Bierley, Mark Roth (Sr./Evanston, Ill./Evanston Township) and William Lanzillo (Sr./Glen Ellyn, Ill./Glenbard West) tied for the team lead in shots with two apiece. The Knights finished the season with a 16-2-3 ledger, the third-most victories in team history.